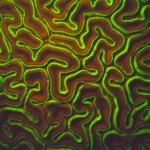 Marine algae contain chlorophyll and several accessory light-capturing molecules to carry out photosynthesis. 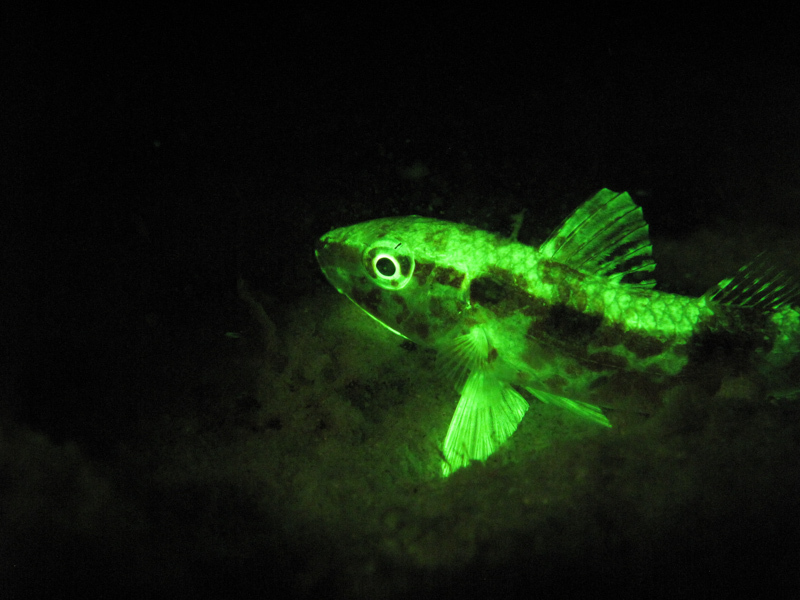 The process is not 100% efficient and some of the energy is lost as fluorescence (see this article for a fun illustration of this). 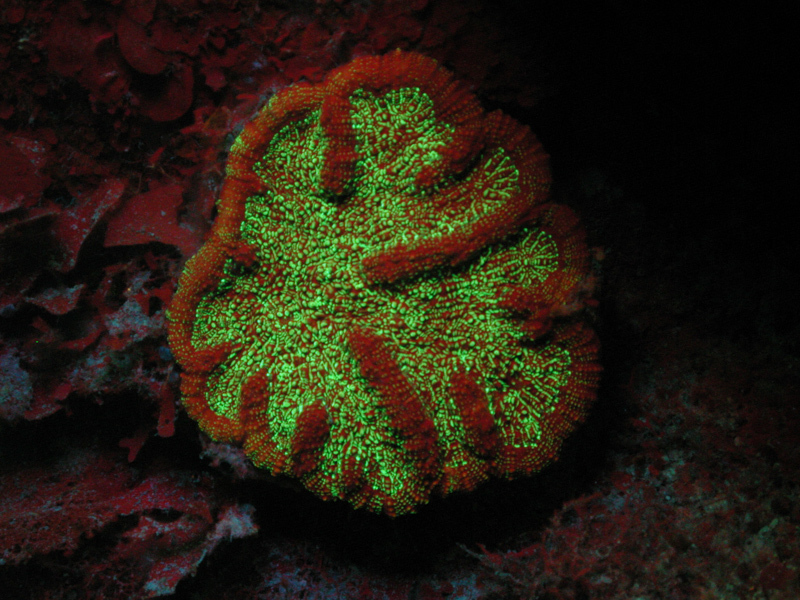 The fluorescence from chlorophyll is in the far red portion of the spectrum and you will see this deep red emission in fluorescence photographs of seaweeds, turf algae, and even the symbiotic single-celled algae that live inside coral tissues. 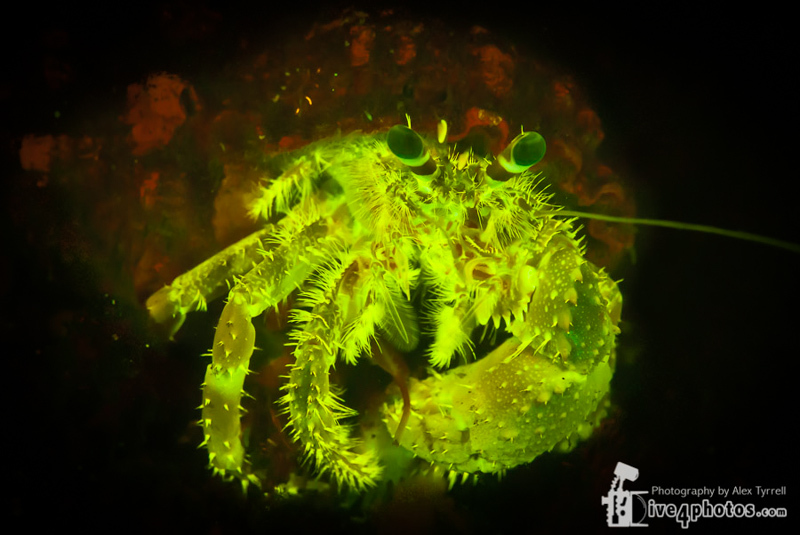 It’s not a strong emission, but easy to see and photograph with the powerful excitation lights and strobe that are available. 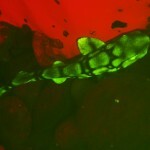 Small shark and seaweed. 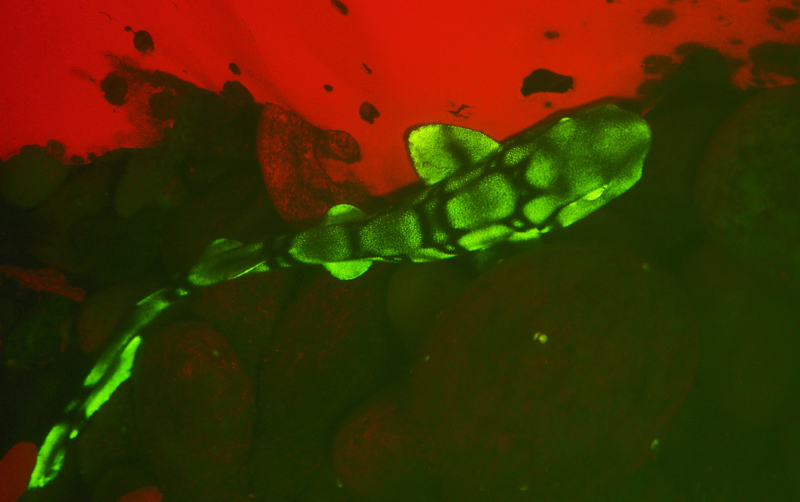 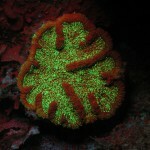 The red fluorescence is from chlorophyll. 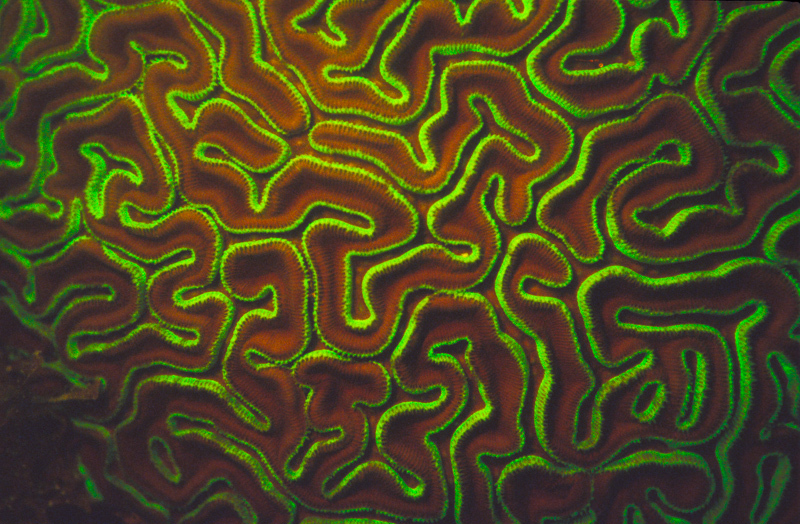 Brain coral showing the red fluorescence from chlorophyll in the symbiotic algae, and green from the fluorescent proteins. 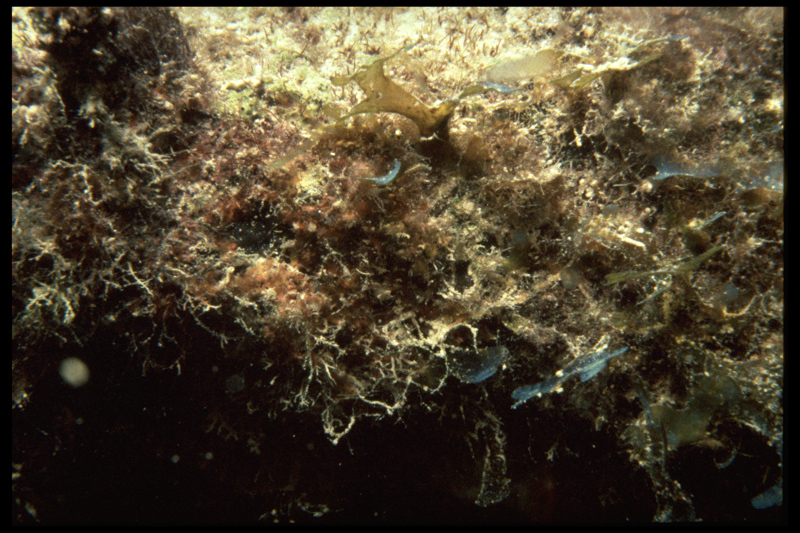 Some algae, the cyanobacteria and the red macroalgae (Cyanophytes) contain an additional set of photosynthetic accessory pigments called phycobiliproteins. 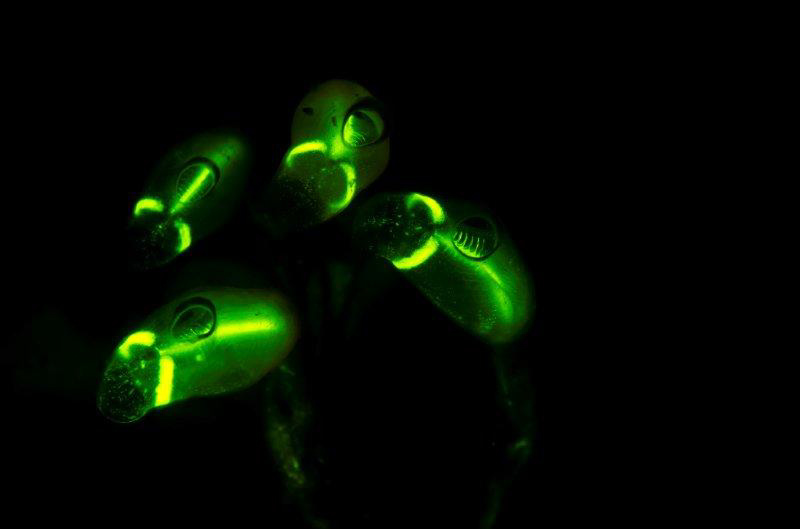 The energy they capture is transferred through a chain of phycobiliproteins (phycoerythrin to phycocyanin to allophycocyanin) and finally to chlorophyll with extremely high efficiency. 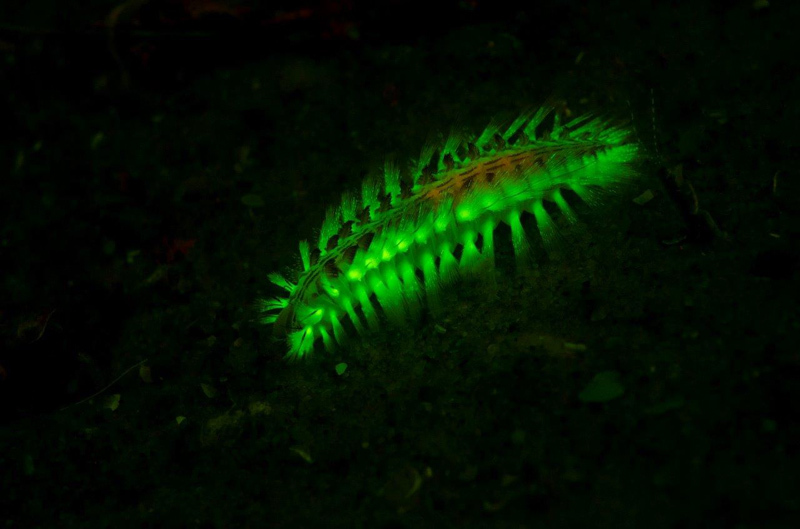 Now here’s the really cool thing – phycoerythrin is just about the most brightly fluorescent molecule in nature, but when it is involved in this transport chain almost no energy comes out as fluorescence. 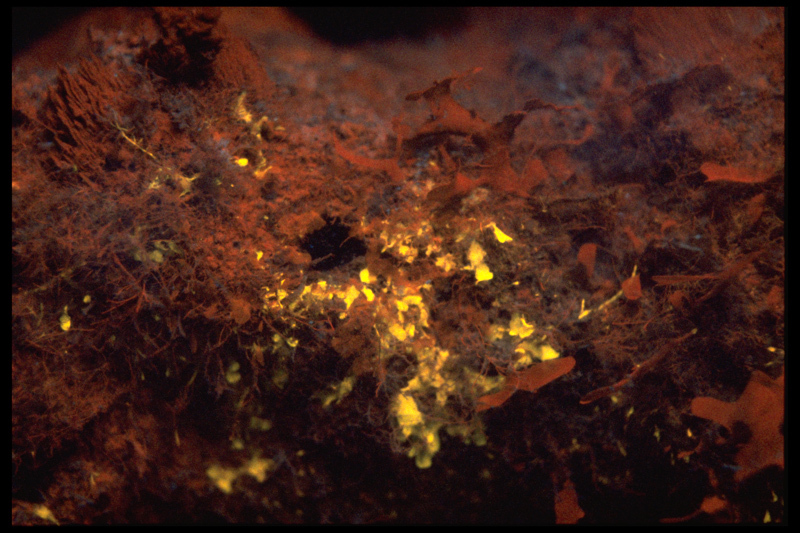 If you break down the transport chain, however, the phycoerythrin is ‘uncoupled’ and emits a bright yellow-orange fluorescence. 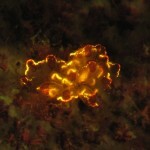 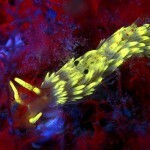 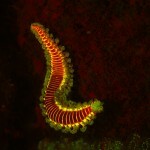 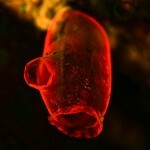 Keep an eye out for this in algae on the reef. 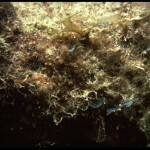 Turf algae on a reef in Florida, white light . 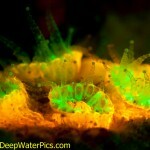 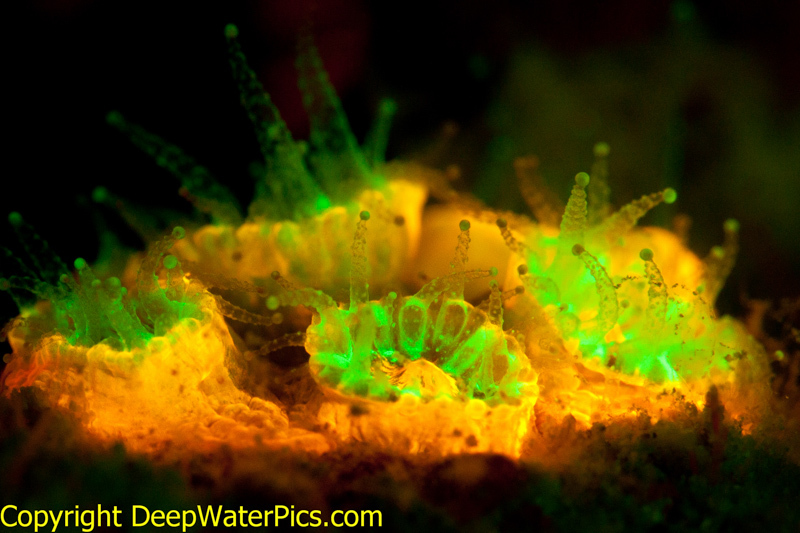 Turf algae on a reef in Florida, fluorescence. 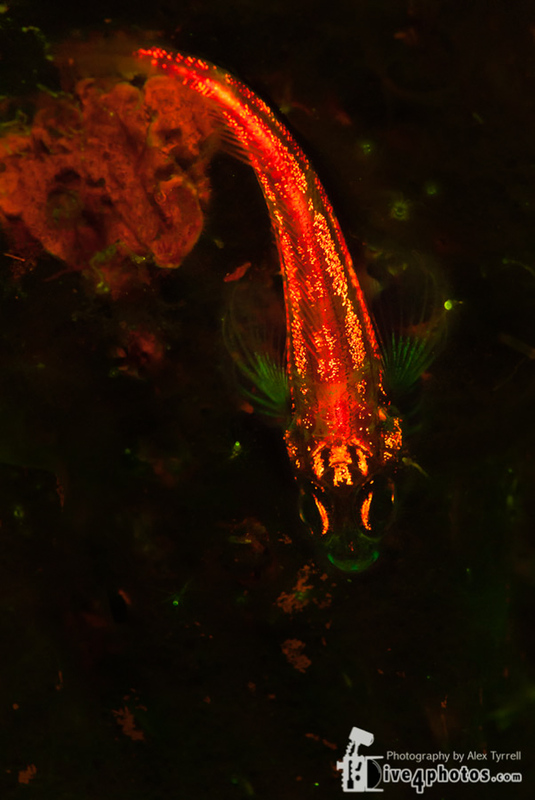 The red is from chlorophyll, the bright yellow from uncoupled phycoerythrin. 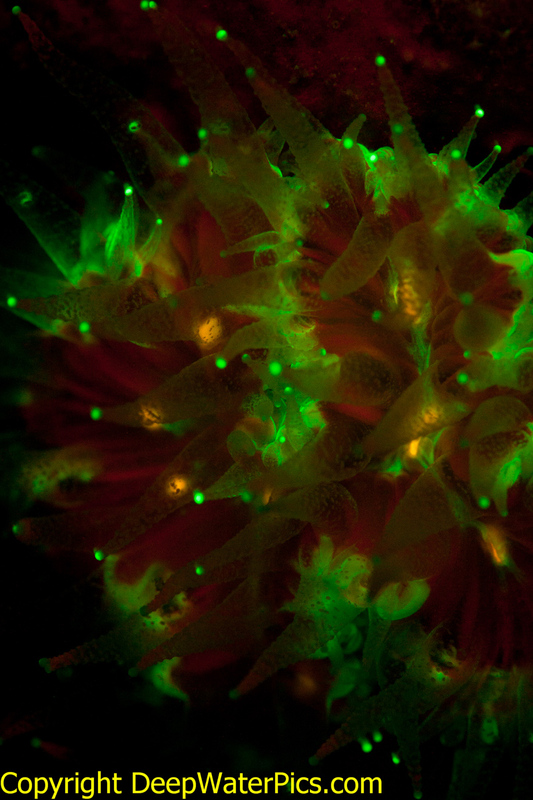 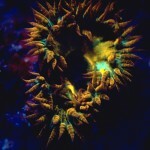 The striking fluorescence that you see in corals and anemones comes from a family of ‘fluorescent proteins’. 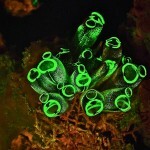 These are REALLY magic and REALLY important, but way too big a topic to cover here. 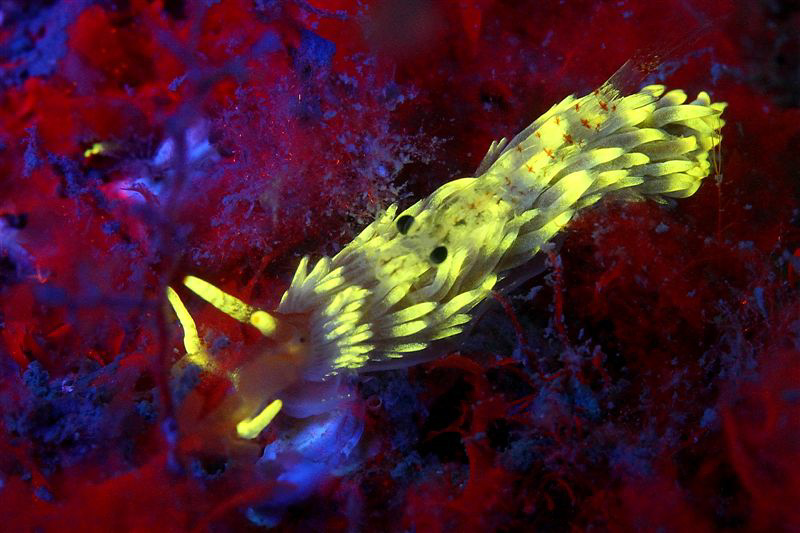 For now, we’ll just tell you that the discovery and application of the special properties of these proteins led to the the 2008 Nobel Prize in Chemistry. 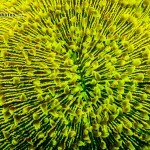 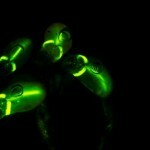 Check out this web site. 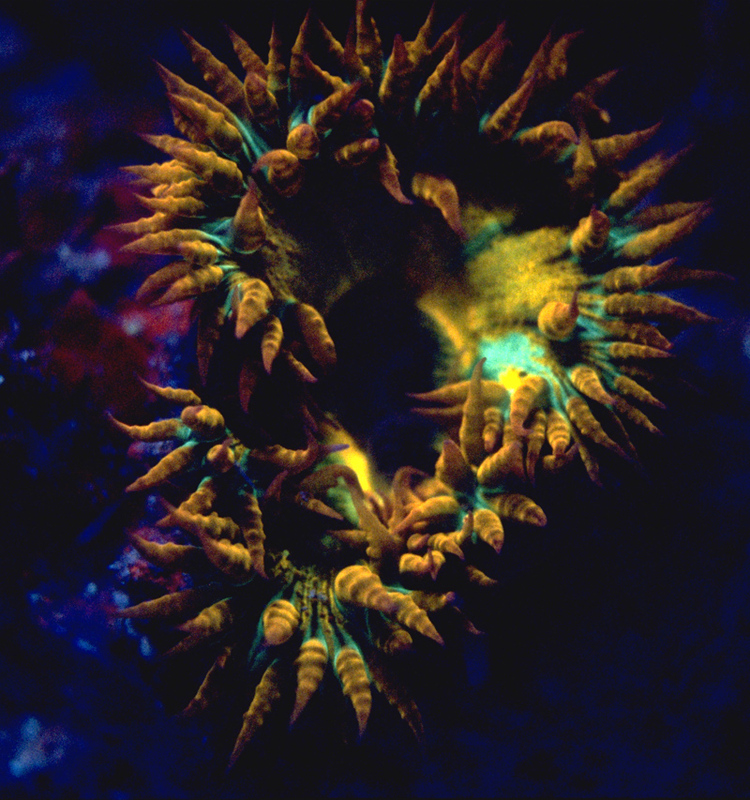 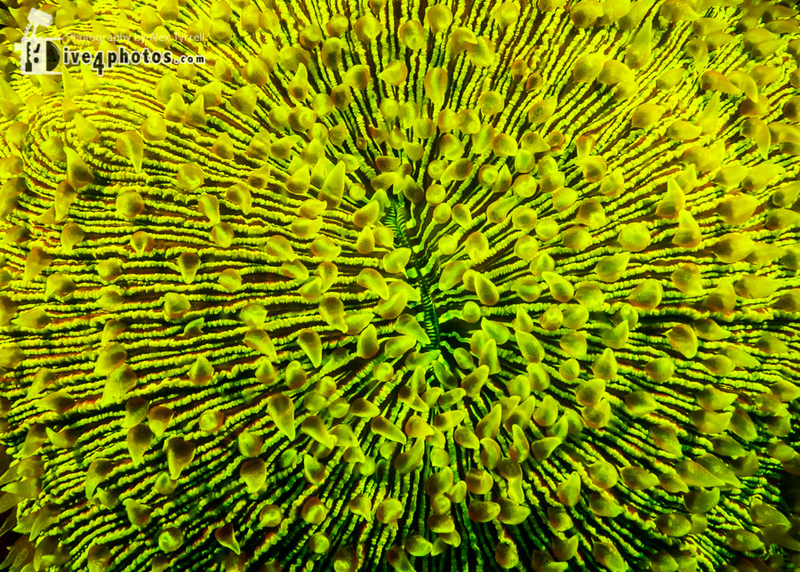 All those bright greens, yellows, and oranges that occur naturally in the corals and anemones are widely used in biotechnology research. 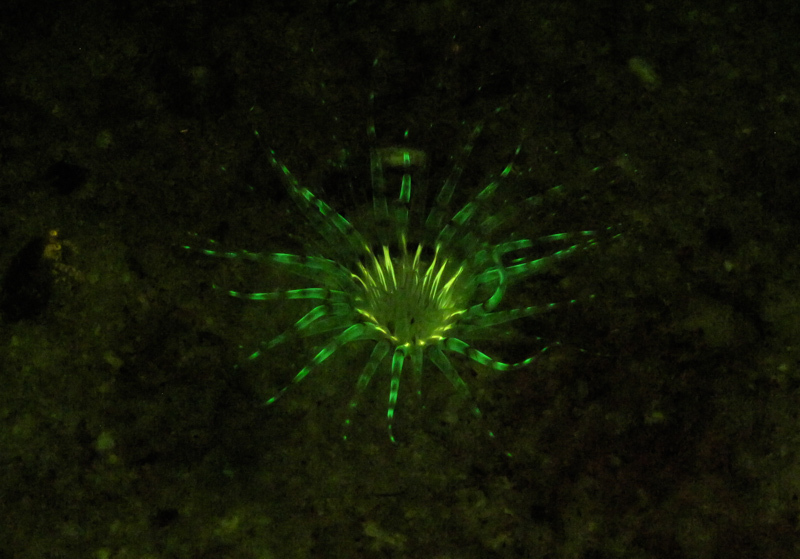 In many (most) cases no one has done the research to find out what is the underlying source of the fluorescence. 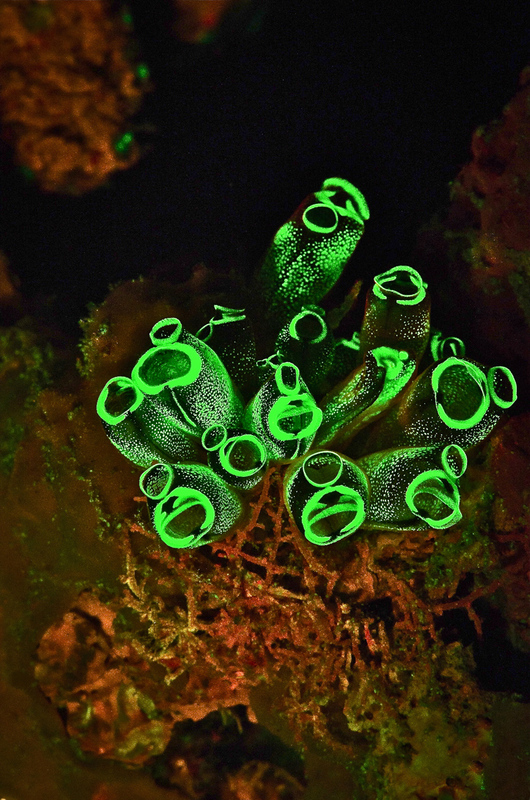 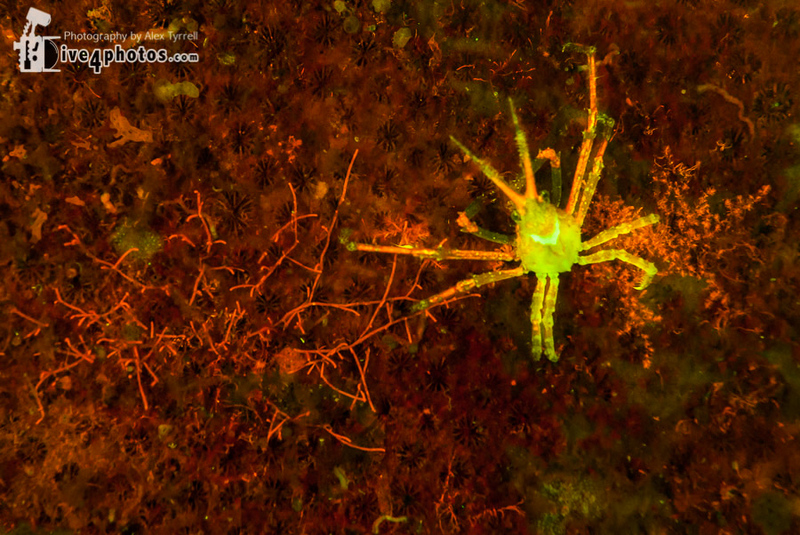 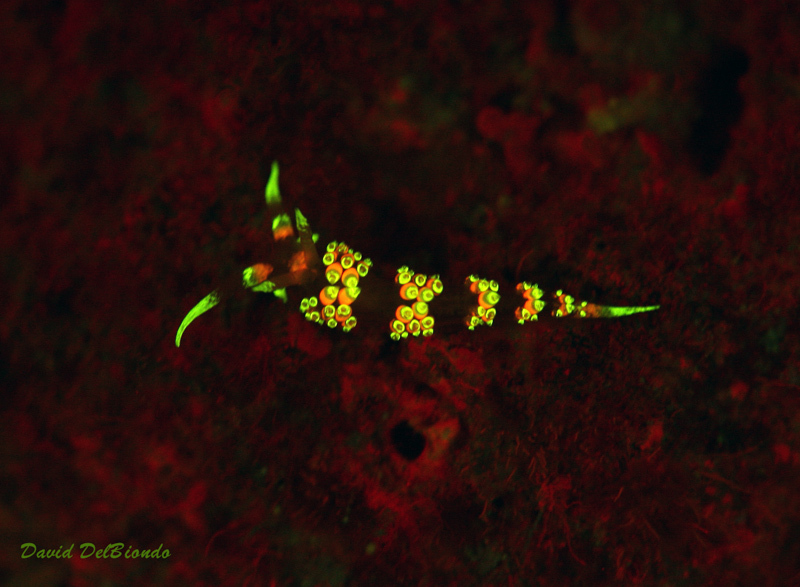 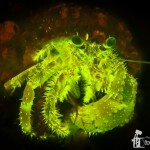 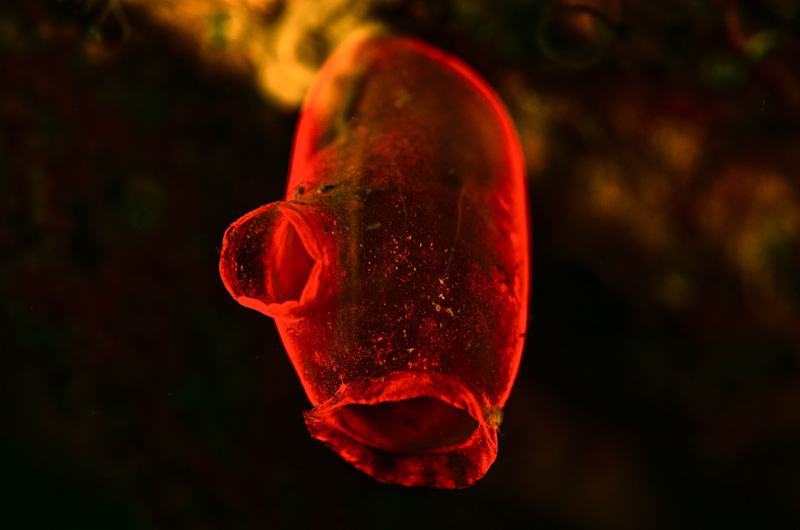 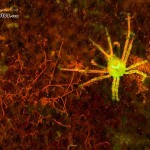 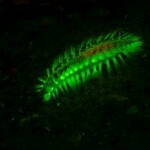 Many species of fish, tunicates, bristleworms, nudibranchs, crinoids, shrimps, crabs, and more exhibit fluorescence, and virtually no work has been done to isolate and characterize the substances responsible. 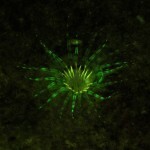 There are starting to be some exceptions. 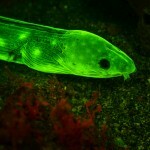 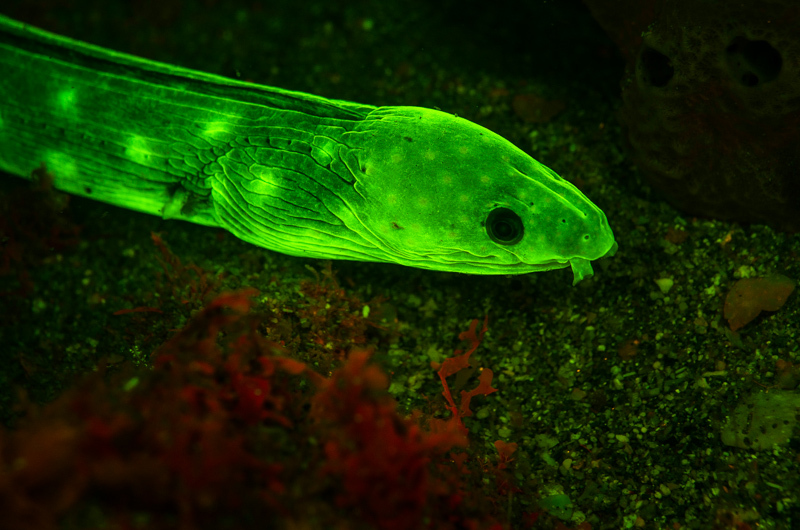 A Japanese group recently found that the strong green fluorescence from the freshwater eel that is the source of unagi, a sushi delicacy, came from a protein that is different from the fluorescent protein family found in corals, but which may also have important applications in research. 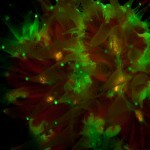 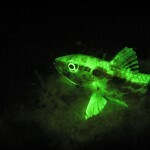 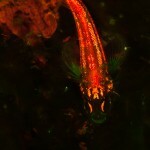 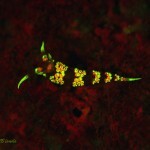 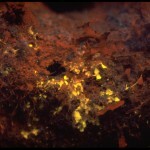 Some sample ‘we don’t know’ pictures below, and plenty more fluorescence pics in the Galleries on this site.